It was Milton Friedman who was the first to talk about ‘helicopter money’ and used the metaphor of a helicopter dropping dollars from the sky. In his model, Friedman was trying to create a simple link between money and inflation. Raising nominal demand this way would have a quick and mathematical effect on price. In these times of negative rates, continued slowdown in consumer demand in most economies and fears of deflation, money thrown from the sky may seem like the only policy response left to our beleaguered central bankers. Accompanied by constant mention of ‘money printing’ by the press, it’s starting to make us feel as though money had become completely worthless to a point of being printed and thrown out of moving aircrafts… a view certainly not lost on many market commentators who in in 2009, when we embarked on the first QE programs, left us pondering if FIAT currencies had seen their time. On the one hand, we haven’t seen the levels of runaway inflation that would have acted as a harbinger of the demise of FIAT currencies. Also, currencies are still able to reflect the fundamentals in an economy and generate enough trust to fulfil their primary function as a stores of wealth. Although slowing down from its peak, cross border trade is still occurring helping nations and their people get closer thanks to newly built commercial ties. All of this thanks to the role of money in the least bad of options available to human kind which is capitalism. On the other hand, even though we still have a price for everything, assessing value has been more and more difficult. To help Swiss Pension plans makes sense of the currency risks embedded in their portfolios, Chris Dreyer of the Swiss CFA Society and Nathalie Miazza of the Fédération des Entreprises Romandes (FER) invited Jean-Pierre Danthine former Vice President of the Swiss National Bank (SNB) to speak at their Swiss Pensions Conference on the role of Central Banks in managing money. To drive this point even further we were all given a dollar bill folded as an airplane with our documents. The CFA Society’s version of helicopter money it seems. ‘Central banks need to pass the torch and they need to leave markets alone’ opines Danthine and goes on to add ‘deflationary worries are overdone. When there is too much liquidity, structural periods of low inflation are an opportunity for markets. Bear in mind recessions always come when central banks use the ‘monetary brakes’ by raising rates. Today, there’s no risk of this happening as inflation is subdued and the Fed in the US is happy to be behind the curve’. Admittedly, we’re far from being in a normal cycle. According to Danthine, the only way to get inflation back to 2% is through the Coué method (from a French pharmacist who spoke of positive reinforcements and feedback loops) and although limited, would affect the economic agents in the economy by influencing how they see prices going forward. ‘QE ad nauseam is very dangerous’ interjects Danthine. ‘QE and currency wars are the same thing and no distinction needs to be made between the two. This beggar thy neighbour approach can only end in tears’. In the case of Switzerland for instance, NIRP (the Negative Interest Rate Policy) has become an unwelcome necessity at this juncture for the SNB as the Franc is too strong and uncompetitive. As long as the ECB is accommodative, rates will have to go lower in Switzerland although it has very limited benefits to the overall economy. IF the SNB reduces rates let’s say from 2% to 1.25% hypothetically, that’s a 75bps move which can help stimulate demand for credit. But in today’s world and as we delve deeper into negative territory, would a 75bps move have the same effect? Probably not as the cost of borrow for corporates wouldn’t move. At this stage, QE and NIRP are about currencies and only indirectly about the overall economy’ he opines. It’s interesting that for the amount of market participants that will claim there is too much leverage and debt in the world there are as many that state the opposite. Danthine is firmly with the latter. ‘The world-wide savings rate is too high’ states Danthine ‘and up until now the imbalance/equilibrium between savings and investment is heavily skewed towards keeping rates lower. Competition between holders of capital is bringing down yields and with negative rates, you’re compounding this problem by forcing investment.’ We can expect that trend to reverse according to him and should most likely see cycles where inflation will be higher. 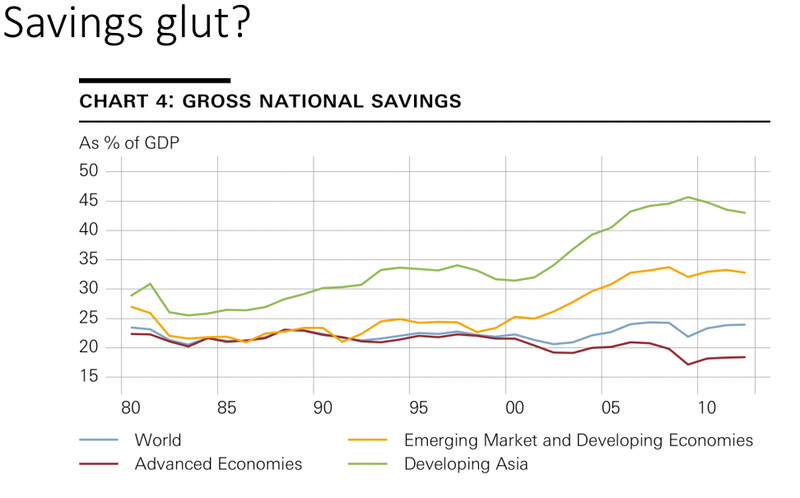 He went on to give us several examples where the global trend regarding savings levels is reversing: (1) in ’98, during the Asian currency crisis, reserve levels went higher acting as a buffer in case the NPL problems reoccurred. This is now changing (2) China also had very high reserves to increase the value of the RMB against the dollar. The currency is now devaluing slowly reducing reserve requirements (3) the Middle East had a surplus of petro dollars with the recent fall in the commodity prices also reversing this trend. Pressure on interest rates should therefore fall as these trends all reverse with the last currency manipulator (i.e. Germany), with its giant trade surplus, going against this grain for now. ‘In the long run though we have to avoid secular stagnation and focus on its primary sources’ claims Danthine. ‘Admittedly, it’s a very American preoccupation. We’ve witnessed a recent period of strong productivity gains, exceptional by most accounts and according to pessimists it’s unsustainable….the end of innovation, the ageing of the populations of the developed world are all put forward as reasons.’ He feels we’re still on the right path and as a base scenario sees a slow and drawn out recovery with weak growth thanks to continued productivity gains. Switzerland will have a long wait due to the strong CHF and will need for Europe to normalize first. For solid growth, important and difficult reforms need to be made. Si vis pacem, para bellum (if you want peace, prepare for war) Vegetius (Epitoma Rei Militaris). ‘Pension plans in Switzerland are forced to be short term in their approach (negative rates are forcing them in that direction) but regulation must change to let them invest longer term and take on currency risk without having to match liabilities with assets in CHF’ opines Danthine. The Swiss franc is overvalued by the simple means that it is several standard deviations from its long term trend line. ‘If you are of the belief it will always be a currency in structural appreciation (due to its safe haven status) it is still too expensive….even more so if you feel there’s a cyclical component to the currency’s appreciation. Forcing Plans to be long the Swiss franc at this stage is dangerous and short sighted’ he concludes.